A tower that leans, you say? 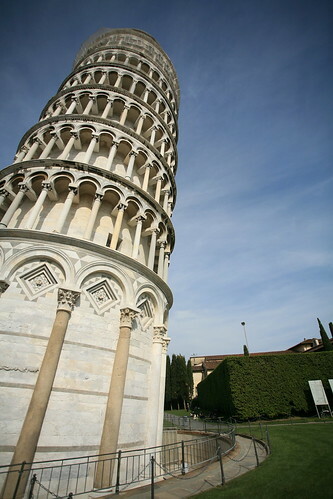 Leaning Tower, Pisa, originally uploaded by kmcgivney. While we were on our honeymoon, we took a day trip to Pisa to check out the Piazza dei Miracoli (Square of Miracles), which contains the world-famous Leaning Tower. We didn't have time to climb up the tower as there was a 6 hour (!) wait for a climbing time. They only allow a set number of people up in the tower at a time due to its, er, structural issues, so we decided to pass and instead took photos inside the Baptistery (one here) and the Duomo (cathedral). Many efforts have been made over the years to stabilize the tower and keep it from completely falling over, but it still leans and offers a great opportunity to play with perspective. I shot this with the Canon 5D and a Canon 17-40mm f4 lens at its shortest focal length. The wide angle at 17mm causes some perspective distortion. This, along with the direction that I was pointing the camera, makes the bottom of the campanile look larger while making it look like the tower leans much more than it actually does. Leica R, originally uploaded by Atom Moore. Recently, we had a loaner of a Hasselblad H3DII, which is a high-end medium format digital SLR. My husband took the opportunity to use it to document our entire camera collection. He set up a little mini-studio on our dining room table and got to shooting. Now that I have recovered from the seizures I had from the dozens of times the flash fired, I thought I'd share them. This photo is of two of my film SLRs. (Yes, I still shoot film sometimes. I'm super retro.) 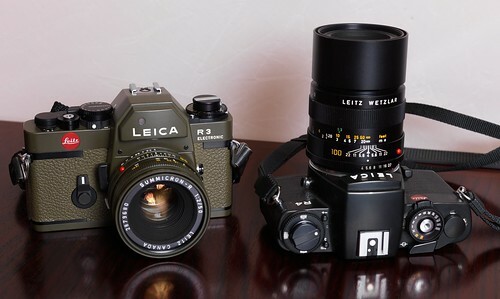 The one on the left is a limited-edition Leica R3 Safari with a matching 50mm f2 Summicron lens, made in the late '70s. The one on the right, taking an unauthorized nap break, is a Leica R4, the R3's successor, with a 100mm f4 macro lens. Both are manual focus cameras but have exposure meters and both manual and automatic exposure modes. The rest of our collection can be seen here. My husband and I are very much into photography (in case you couldn't tell already). 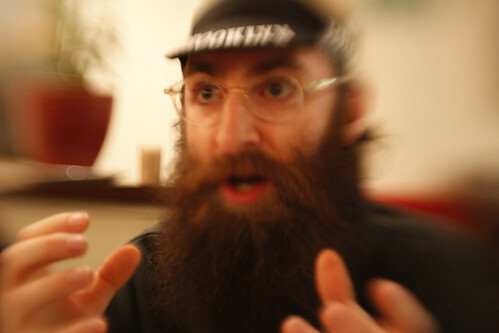 He is a professional photographer who has just returned to freelancing after working for a pro rental house. 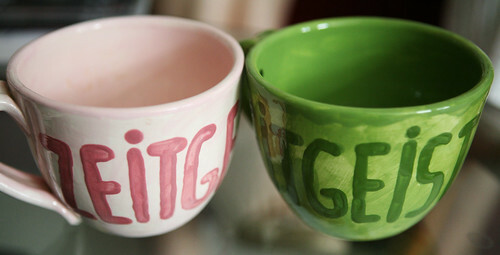 I'm a hobbyist, but a pretty serious one. We share cameras and lenses, made easier by the fact that we both use the same SLR system (Canon). 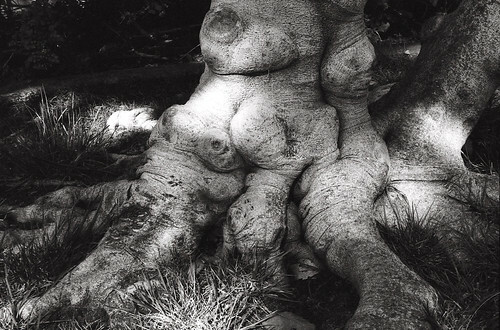 So, when we go on vacation, we don't just hit up the typical tourist spots and take posed photos - we walk around, soak in the beauty of wherever we happen to be, and take photos of whatever catches our eye. We took these of each other in the elevator inside the Duomo Museum in Florence. Atom is using a Sigma DP-1, a fixed-lens, wide-angle compact camera that uses the Foveon X3 sensor. (It doesn't normally have a viewfinder on the top; he attached a 28mm Voigtlander viewfinder to the hotshoe.) 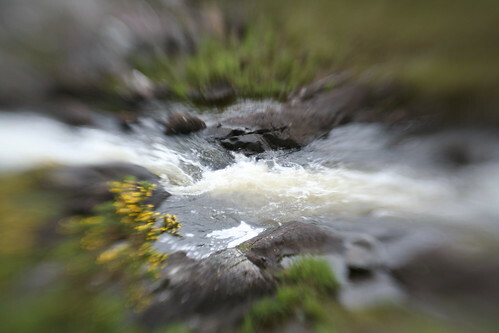 I am using a Canon EOS 5D SLR with a Lensbaby, which is a hybrid of a tilt-shift and a bellows lens that allows the photographer to create a selective focus effect. I use Lensbabies to create images like the creepy statue, and of course, the one of Atom above.